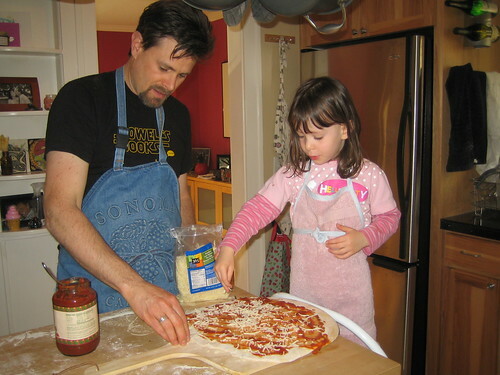 Seems like pizza night has become a fairly common way for American families to carve out some together time. For me it's great because while I really crave structure and ritual, I am really not very good at creating either one. And, of course, it combines two of my favorite things: cooking and eating! 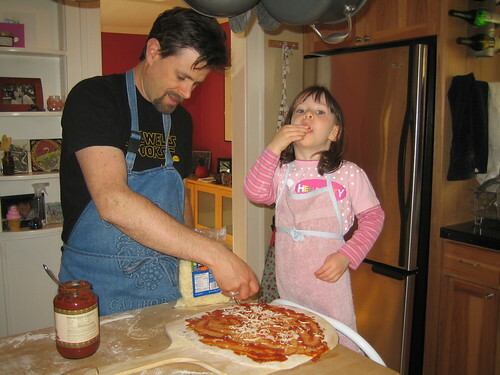 We've only recently begun a sort-of-weekly pizza night. The plan is to do it on Fridays, although we're flexible. One time we had friends come over and our three girls got to help together. The dads got overly enthusiastic and ended up making four large pizzas, which we managed to make a pretty good dent in anyway! I begin by using one of my 5-minute-bread recipes (the olive oil bread), which I usually prepare at least a day ahead (that's not necessary — it just makes it easier for me). Anna helps with the sauce (marinara) and cheese (fresh or shredded mozzarella, feta) and then the grown-ups decide on additional veggie toppings (Anna's still a cheese-only girl). This, like most things I enjoy making, is a very flexible process. You can roll the dough as thin or thick as you like, add jar sauce or make your own (or, in summer, just use fresh tomatoes, pesto, etc. 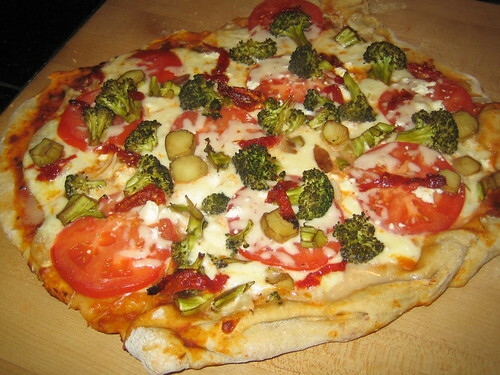 ), and use whatever you can scrounge for toppings. I'm including the olive oil bread recipe, but as I've said many times before, I highly recommend buying the book. Add in flour. Do not knead, but you may need to use your hands to incorporate last bits of flour. Cover and allow to rest at room temperature at least 2 hours. When you're ready to make pizzas, take a grapefruit-sized hunk of dough and form a ball. Allow to rest about 15-minutes (this step isn't necessary, but helps keep the dough from snapping back when you roll it out). Dust with flour to keep from sticking. 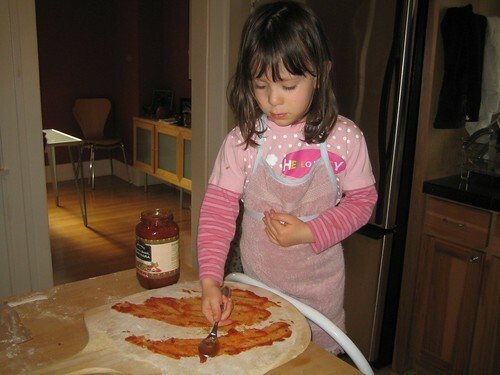 Use a rolling pin to make your crust, top with sauce, cheese, veggies, etc and bake on a pizza stone dusted with cornmeal (or cookie sheet) at 500 degrees 8-10 minutes (Or longer if desired).